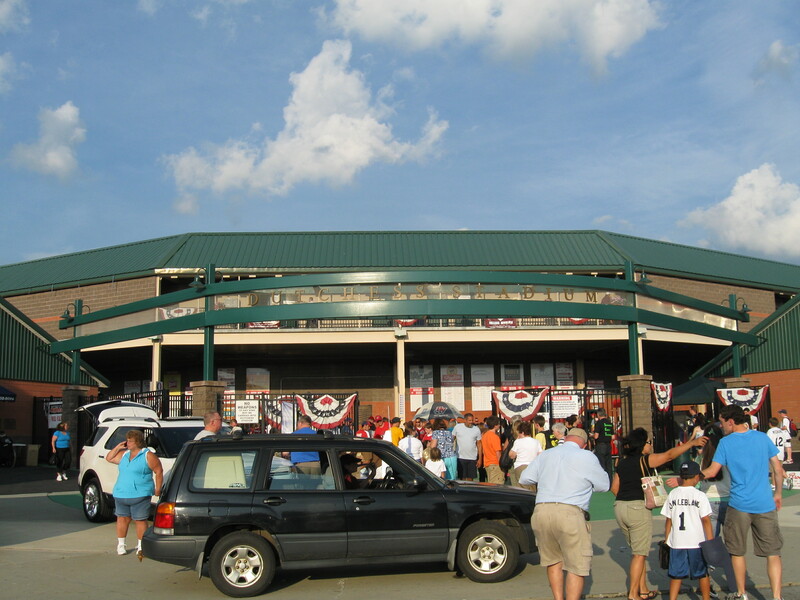 Last Friday Night, was visit #105 as the Hudson Valley was the destination to check out Dutchess Stadium and the Renegades of baseball’s NY-Penn League. For the full detailed review, click here. Also, I’ll be doing a review that will be posted soon over Stadium Journey. I can tell you that the game was in the Southern part of Dutchess County, just on the west side of the Hudson River, but as for the town name…that I’m not so sure. The website and mailing address is Wappingers Falls, yet Fishkill is the much closer town. Or maybe, its Beacon, where the high school is less than a mile away (as the crow flies). I think its Fishkill so we’ll go with that. I had a nice time at the ballgame and the Renegades do a good job. I grabbed a quick dinner at Leo’s Pizzeria in a little plaza near the ballpark and then headed on over, parking in the overpriced $5 lots. Prices are disappointing here as the total cost is near or slightly more than at the Norfolk Tides (AAA) game I attended in May. The ballpark design is not anything special, but it was remarkably built in 71 days and does not have that much of a cheap feel. I do like the very pleasant backdrop in the outfield as trees tower over the wall and you can see rolling hills looking beyond the right foul pole. Very representative of the area. The atmosphere inside was pretty good and the fan support is excellent as fans continue to post high attendance numbers (in relation to % of capacity) ever since the team started in 1994. Great to see, consistent support over the long haul. I read a lot of other ballpark reviews talking about the over-the-top contests, sound effects and festival atmosphere. It seems like the Renegades have cut back on that and even though those things are still there, it didn’t feel overly excessive and wasn’t anything unusual to the minor league game. So good news there if they did make adjustments. They do have some crazy and interesting promotions and that is thanks to the franchise being owned by the Goldklang Group, whom Mike Veeck is a part of. The Veeck name should be familiar as Mike’s father Bill is THE man when comes to creating the minor league baseball promotion phenomena. I’m usually against the wackiness, but the stuff during our game was entertaining and not terribly distracting. That had an interesting giveaway where one woman won a $4,000 diamond, by going through a series of contests. They also had a “Bed & Breakfast” night, where some fans spent the night at the ballpark, slept in a suite and had breakfast the next morning. The promotional stuff also didn’t take away from fan focus as cheers were loud during big plays and a smattering of fans stood and cheered during a home run. They also swayed their arms to Naughty by Nature’s “Hip-Hop Hooray“….old school baby. But it shows this was not fans’ first game. Overall, pretty good stuff at “The Dutch” and its a ballpark I enjoyed probably a bit more than it was ranked, plus for a smaller ballpark they really pack in a ton of variety in the food department. Special thanks to Kristen Huss on the visit! Oh yeah…the game. Can the home side please get a win! 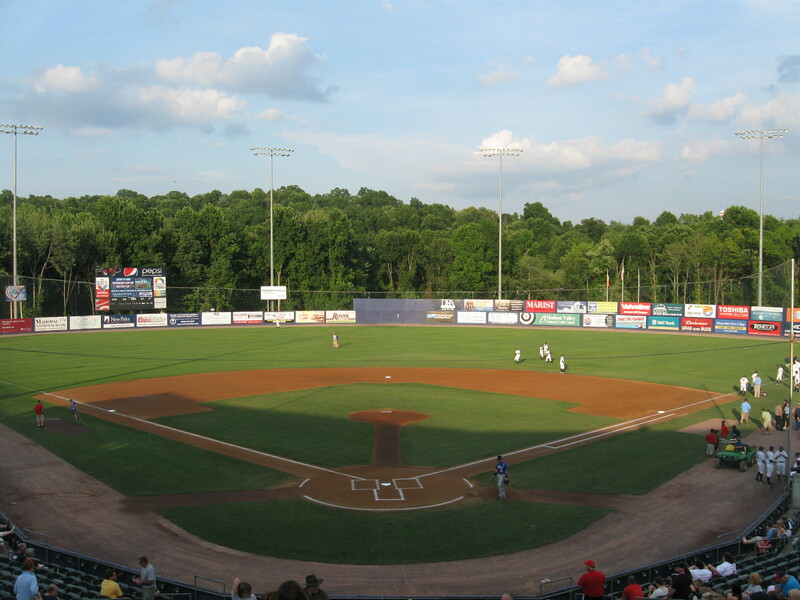 The new stadium, home team losing streak has reached a career-low five straight as Hudson Valley fell to Aberdeen 10-3. It started bleakly as Aberdeen scored two in the first and another one an inning later. Hudson Valley showed some hope as they tied the game in the third thanks to a triple, followed by a Leonardo Reginatto two-run home run later in the inning. The excitement was short lived though as Aberdeen sent 11 batters to the plate in the next inning. They scored 7 runs on 7 hits and that was the ball game as the Renegades only got 2 more hits the rest of the way. Most of the runs were attributed to starter Parker Markel who came into the game with a 0.88 ERA in 40 1/3 innings. Yikes….sorry Parker. Also, I’m glad I came to this game as the next night was rained out. Hopefully Mother Nature can shine on the Fishkill-Wappingers Falls area a little more as that was the team’s 4th rainout this season out of their 26 schedule home dates.